If you’re planning to go swim with dolphins in Cancun, we have something better: a very close encounter without the need for a diving suit – walk underwater, hand in fin with these mammals without even getting your hair wet. Who hasn’t dreamt of traveling to outer space in an astronaut’s outfit? Now you can experience a similar adventure, only better: next to dolphins and in one of the most beautiful spots at Riviera Maya! This experience has become a worldwide phenomenon and Delphinus Trek in Xel-Há is the only place in Mexico where you can go on your underwater astronaut walk along with these beautiful mammals and have the certainty that you’ll be wearing the best equipment and technology. All of this because we want you to have the best adventure possible. Xel-Há is located in Riviera Maya and is considered a Natural Wonder of our nation. Legend has it that the gods gave the best of themselves to create that beautiful place and to make sure it would be well protected, they named three guardians: Huh – iguana keeper of the earth; Mo – macaw keeper of the skies, and Kay-Op, fish keeper of the waters. In the Mayan language, the name means "where the water is born". It is a magnificent place, full of richness, and because of its strategic location, it has been a port of shelter, shopping center, pilgrimage point and shelter for sailors. It also worked as a food reserve during bad weather. In addition, the commitment to sustaining a balance with the environment becomes evident with the programs implemented by Xel-Há and its Environmental Management System. So, do not hesitate. 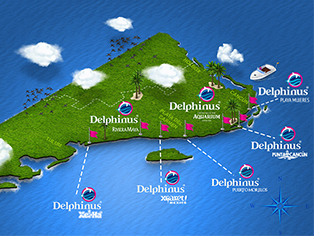 The best swimming experience with dolphins in Cancun that you can have this summer, you will find at Delphinus Trek Xel-Há. Book your place now!